Sometimes your metal stamped message needs a little punctuation for emphasis. 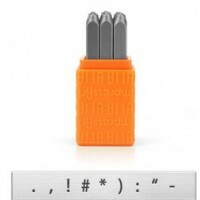 Use punctuation stamps for asterisks, hashtags, exclamation points and more. There are a range of character sizes to choose from. The font is neutral enough to match several different types of font. Punctuation stamps add that extra touch and meaning to your stamped words and phrases.